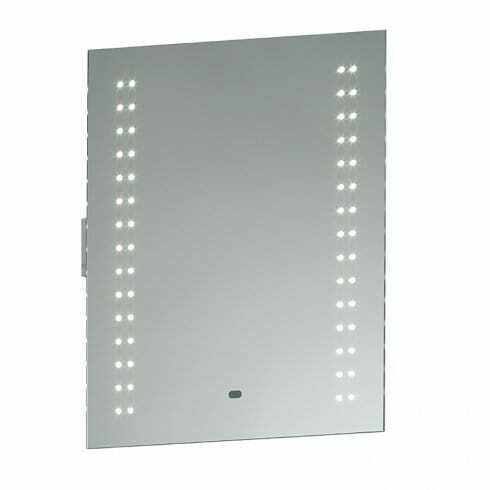 Endon Lighting Perle 2 light LED illuminated bathroom mirror is a stylish rectangular design mirror with twin rows of cool white LED lights at each side. The product code for this Endon bathroom mirror is 13760. The Perle LED mirror is contemporary in design, adding a touch of style to any bathroom and the 30 cool white LEDs neatly positioned around the mirror to provide a sharp, crisp light. Additional features include a built in shaver socket and a motion sensor to switch the mirror on & off. This product is IP44 rated and comes with a 5 year warranty.